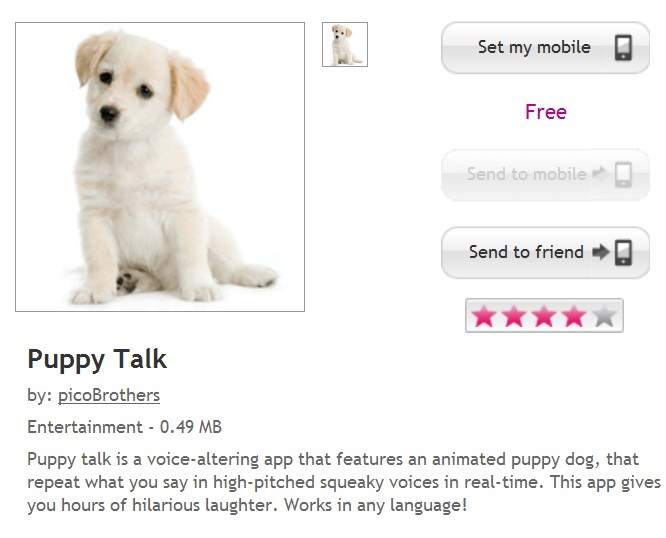 Puppy Talk voice altering app Free At Ovi Store – from picoBrothers! Here’s an app called Puppy Talk. It’s free at the Ovi Store and should be worth a try! I’ve seen an app like this with iOS (with a cat) and on Windows Phone (with a Polar Bear – kinda creepy, it makes your voice deeper). Basically, it records your voice (altering the pitch) and animates it (most often to an animal). We’ve actually had apps like this on Symbian before iPhone existed. Remember that hamster? That was ground breaking at the time! Ah, my 7610 rocked some awesome apps. I’ve no idea what the app is actually like as it’s not installing. Again bringing up good old “smart installer”. Maybe you’ll have better luck. The best version of these apps I’ve seen is called Morfo (on Windows Phone). I’ll do a demo soon but basically it takes a face, turns it 3D, animates it and you can record voices, make it high pitch, move it about etc. It’s a lot of fun, brings a lot of talk, especially how creepily good it is. « Facelock App coming Q2 to Symbian Phones – unlock your phone…with your face!